PARIS, France, November 29, 2015 (ENS) – On the eve of the Paris Climate Summit, more than 570,000 people around the world took to the streets this weekend for a record-breaking Global Climate March. They sent a message to world leaders meeting in Paris Monday “to scale up action on climate change to achieve 100 percent renewable energy, eliminate poverty and protect people from worsening climate impacts,” in the words of the nonprofit Climate Action Network. In view of the terrorist attacks in Paris that killed 130 people on November 13 and injured hundreds more, French authorities cancelled the event planned for Paris, where 400,000 people were expected to march Sunday. 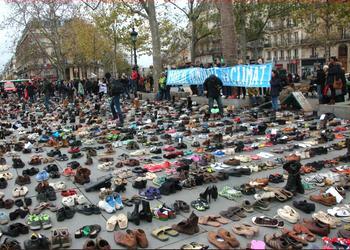 Instead, 22,000 pairs of shoes, including those of Pope Francis and UN Secretary General Ban Ki-moon, were placed at Place de la Republique to symbolize the people who could not march because of the ban. 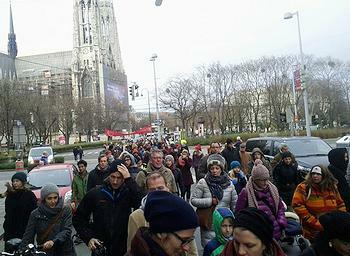 Afterwards, 10,000 people held hands along the route of the planned march in peaceful solidarity with frontline communities affected by climate change. 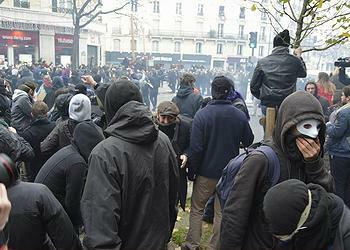 But violence erupted later in the day. Several hundred people, some of them wearing masks, threw objects at riot police blockading the square, spoiling the memorial of flowers and candles for the 130 victims of the terrorist attacks. Interior Minister Bernard Cazeneuve told reporters 174 people were jailed and could be charged. He said 26 others known for violence in the past had been placed under house arrest. People participated in more than 2,300 events across 175 countries. Coming from all walks of life, people from affected communities, development organizations, climate movements, the young and the old, people of faith, indigenous people, trade unionists and many others marched to create momentum for world leaders to agree to the world’s first universal, legally-binding pact to limit greenhouse gas emissions responsible for global warming. 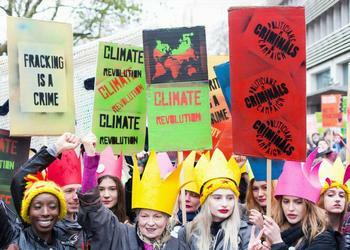 Records were broken in more than 10 countries, which saw their biggest-ever climate marches. Australia turned out140,000, including 60,000 in Melbourne. In India another 140,000 people marched. New Zealand marchers numbered 33,000. Britain saw over 50,000 marchers in London alone, Italy turned out more than 20,000 in Rome, and in Spain over 20,000 marched in Madrid. Events took place in countries as diverse as Austria, Mongolia, Saudi Arabia and Samoa. A march took place in Sanaa, Yemen, despite bombs falling close to the start of the march. Nuns marched in South Korea; there were marches in the the Pacific island nations New Caledonia and the Marshall Islands, where people could lose entire islands to sea level rise. African people marched in cities in Senegal, The Gambia, Cote d’Ivoire, and Nigeria; and in Kenya, there was a march across the Equator. “As someone from Kenya, a country which is feeling the impact of climate change, it means a lot to see people from all walks of life, of every colour and creed, speaking with one voice about climate change,” said Mohamed Adow, senior climate advisor, with Christian Aid. 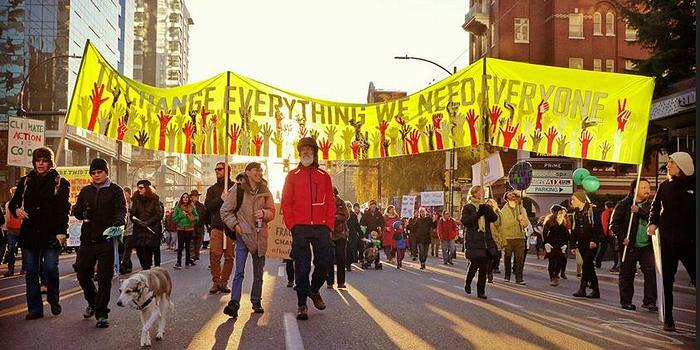 Although many planned civil society activities have been cancelled by French authorities worried about terrorist attacks, a strong, diverse coalition of groups supporting climate action will be in Paris during the Climate Summit to maintain pressure on governments to deliver an ambitious agreement.